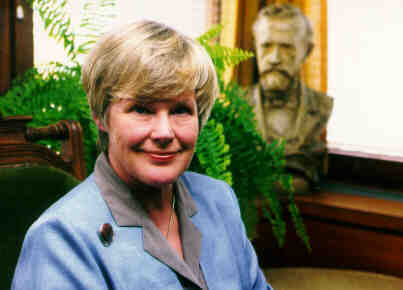 FinnFest USA ’99 Welcomes Elisabeth Rehn! FinnFest organizers are pleased to announce the Finnish celebrity guest at this summer’s festival in July: Mrs. Elisabeth Rehn. Mrs. Rehn is well known in Finland and all over the world. 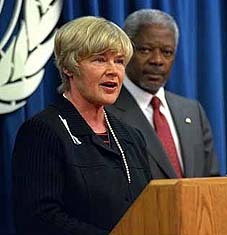 She has a long and prominent political career in Finland, the European Union and most recently, the United Nations where she is serving as Special Representative of Secretary General in Bosnia. She served as Finland’s Minister of Defense from 1990-95 and came in second in a close election for the Finnish Presidency in 1994. Mrs. Rehn will be giving a special lecture to the FinnFest audience on Saturday afternoon, July 24. Her topic will be "UN Involvement in International Affairs--Finland’s Participation." She will also attend the Saturday evening Banquet and will share her thoughts on the role of the international Finn.